For me, Easter in New Zealand marks the end of the warm Autumn days and the beginning of the cooler months. We enjoy the novelty of lighting the fire and enjoying warm home cooked meals with a glass of one of Hawkes Bay’s finest red wines. This year, Easter falls in the middle of the school holidays, and like many parents I am struggling to come up with creative ways to entertain the kids for two whole weeks! 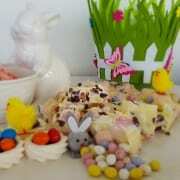 And keep them away from screens… Easter often brings cold, wet weather, so some of the parents of DISH have come together with some of our favourite Easter recipes, simple enough to make with the kids on those wintery days, when all you want to do is spend the day snuggled inside! Suz, our fabulous Patisserie Chef loves making Malteser Slice with her three kids – its super simple, and so moreish! Line a 20x30cm slice tin with baking paper. Melt butter, golden syrup and dark cooking chocolate in a bowl set over a pot of simmering water, stir until melted and blended well. Mix in crushed malt biscuits, and allow to cool slightly before adding Malteasers. (we like to leave a few Malteasers aside to dot on the top of the slice). Press mixture firmly into the slice tin and Drizzle the slice with melted chocolate if desired. Put the slice in the fridge to set, cut into chunks and store in a cool place. 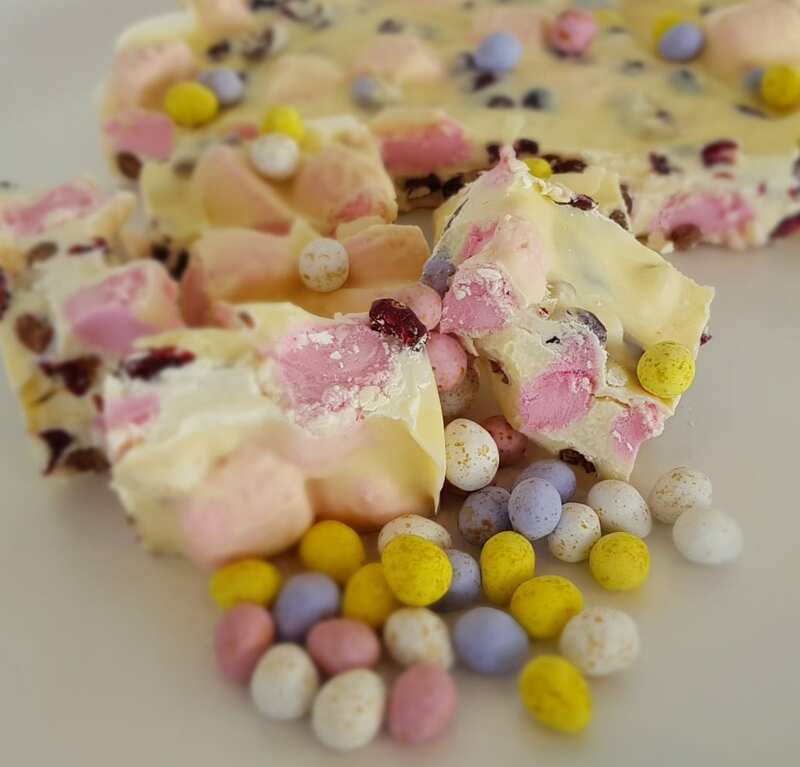 This recipe for Easter Rocky Road is a favourite for Pippa and her two boys – its very quick and easy to make, a great gift, and never lasts long…. Ready in 20 minutes + setting time, makes approx. 25 pieces and is Gluten Free! Line a 20x30cm slice tin with baking paper (or use a smaller tin if you would like a chunkier slice). Melt chocolate in a bowl over a pot of simmering water, stir until all chocolate is melted. Remove the bowl from the heat and stir in the marshmallows, speckled eggs, cranberries and vanilla essence until coated in chocolate. Spoon the mixture into the slice tin. You may wish to sprinkle the top of the slice with coconut or freeze-dried raspberries. Place in the fridge to set. Slice with a hot knife, and store in a cool place. You may wish to substitute the white chocolate with milk or dark chocolate. 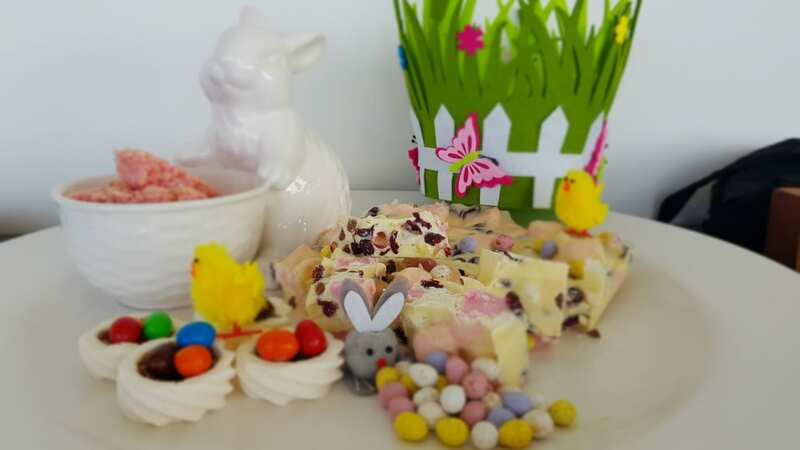 You can also get creative and use nuts, glace cherries, marshmallow Easter eggs as a substitute to any of our ingredients too.